Home Nutrition Honest about Honey! Reasons to try Eucalyptus Honey! My three favorite sweet foods are – Dark Chocolate! Honey! Figs! This time, I decided to take the road less traveled and experimented with Eucalyptus Honey (by the way read this article to know all the good and bad about consuming honey) ! I spent 45 days – eating, licking, clicking and basically finally reviewing one of the best home grown Honey Brands in India – Societe Naturelle! I promise you that this is one thing that will grow on you! A sweet treat for those who like to mix and constantly add to their healthy foods cupboard and fix the sugary craving with healthier options! I’ve managed to replace sugar with great stuff. You can read my article here on how one can try to go lesser and lesser on sugar! How many of you have seen bee farms or even know where your honey is being sourced from? Do you know whether it’s coming from the bees or the factory? Societe Naturelle maintains small bee-keepers and also has its own farms around Kashmir, Dehradun and Ambala (they actively share pictures of their farms on social media). For the Eucalyptus Honey they have the bees forage eucalyptus nectar from the flowers where the specific flower is grown. Given all the controversy in the market about honey and its fake sources etc., I am most comfortable with this brand and have been using it for the last 5 years! Take a look at the bee farms of Societe Naturelle. Eucalyptus honey turned out to be more like a natural home remedy for me than just another honey. I have given it to my kids in their milk, have used it everytime I or my kids have had cough. Sometimes I mix a spoon of eucalyptus honey in my turmeric milk too. In general, it’s like having something you can count on. Just like you buy good hydration for your runs, or healthy organic veggies, I equate having a bottle of euclayptus honey for it’s medicinal goodness. It’s soothing. I also mix it in my warm water for detox. I enjoy the slight menthol like taste but surely some people don’t. It goes beautifully well with my hot glass of milk, it also tastes lovely on a toast, even with chapatis and does great on my yogurts! Just a few nuts, some homemade yogurt and a spoonful of eucalyptus honey – makes for a healthy dessert and a very happy and contended me! But, it doesn’t go very well with my cold mango shakes though and I don’t use it in my muffins and cakes! Neither it goes with salads, but for all of that I go with raw honey! Despite all this – it’s super healthy, super tasty and you need to find way to complement the eucalyptus taste with various foods. I didn’t really believe when the maker and seller of Societe Naturelle (who is an awesome runner himself) told me to massage the eucalyptus honey if I had sore knees!! For me and I am sure for most people, honey – that sticky gooey sweet thingy is meant for my internal consumption only! Not true for me anymore! A very sore area can benefit from circularly massaging a small amount of eucalyptus honey for a couple of days to alleviate the pain. It was later that I read online – “Eucalyptus is recommended to patients suffering from lumbago, sprained ligaments and tendons, stiff muscles, aches, fibrosis and even nerve pain. The analgesic and anti-inflammatory Eucalyptus honey is massaged on the skin surface in circular motion to help relieve muscle and joint pains”. It’s a steal for all that it costs! At Rs. 350 for a 500 grams bottle; it gives all the other foreign brands a run for their money! I trust it because I know where it’s coming from. With the changing weather and the winters setting in a bit, I recommend it highly for everyday use! Chances are that if you are the serious health variety – you have either gone off sugar or are replacing sugar with a good brand of honey! And if you are still on sugar and still the serious healthy kinds, then I would say, try to replace your sugar with a really good brand of honey, for a bit! Experiment!!!! Eucalyptus honey is an excellent addition to your kitchen and your daily health diet! Never forget that everything should be taken in moderation, excess here could lead to weight gain for sure! A spoon is great! 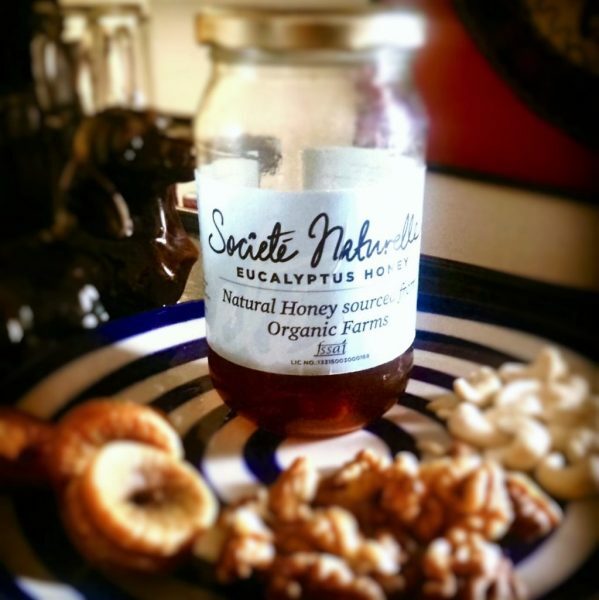 The only brand of eucalyptus honey I have tried is from Societe Naturelle and have not been disappointed, so far! I want to lay my hands on the first bottle of Eucalyptus honey. Been looking for a pure form of honey, honey….am a believer. I have tried a couple of HONEY brands the so called natural, and have never been sure if it is actually so , going through the review and pictures, it definetly appears natural . Moreover the health properties of this looks appealing .I would love to try , and may add it as a regular honey in the kitchen . Makes a convincing case for trapping s of honey . Calorific value per 50ml should be of interest though not sure about menthol n honey combo. Have you tried the chocolate AfterEight? well it’s just to tell you that it’s basically a sweet menthol mix! However the menthol in this honey is subtle! Try it! Yes Sir!!!! Back in July 2015! You had me interested from the outset, Tanya, but when I read the words “sprained ligament” – well, I’m hooked! Sitting at home, nursing a torn ligament in my right foot, which is in a plaster cast, the idea that eucalyptus honey might help in the healing process sounds amazing. Am definitely going to try this. Have been on a pure honey hunt for a while….. As I love honey with almonds … And various other forms … Wud def give it a try ….mainly because now I know d source …. I am a runner and sore muscles, ligament tear and sprains and aches are not new to me. Would love to try this and see how it works!!!!!! Eucalyptus Is unbelievably beneficial and mix it with real honey which again is a gods gift.. Brilliant!!! Received my tester pack of HONEY. Thanks the tester itself looks great 4 bottles of different tastes . Gives me a feeling of Scotland… whisky testers cheers to Socite Naturelle will definitely share my experience post trying all of them. After going through above blog i was excited at-last some good organic honey to grab, and not some sugary syrup. i was so excited that immediately want to order it. googling resulted into one of the online shopping portal. Thought before ordering i should read comments so that i can gain more confidence on this product. After reading some reviews all my excitement died down, it was kind of mixed reviews, some were complaining about product quality, eg doesn’t smell good, one was talking about white sugary layer which is formed in every other honey. I was wondering how come nothing like that sort has been mentioned in this blog.